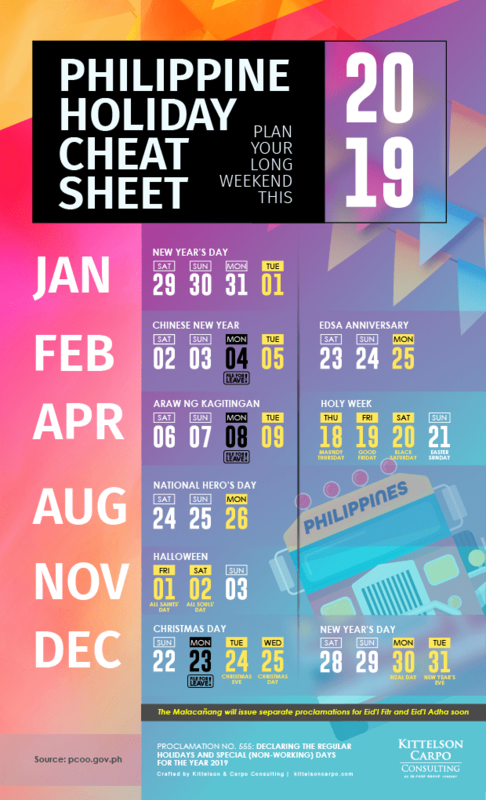 Knowing the dates of Holidays 2019 here in the Philippines is important because it helps you plan your trips, travels, stay-cations, and other important events and appointments for the year. If you know when the holidays fall, you’ll be able to make adjustments to your plans specifically on the dates that have long weekends. Eid’l Fitr and Eid’l Adha will be announced soon. Why do we need to know the Philippine Holidays 2019? Many people want to know the schedule of Philippine Holidays 2019 for various reasons. For regular travelers, they want to mark their calendars for their upcoming travels or events. For entrepreneurs, they want to know the possible dates of their promos and sales. For teachers, they want to know how they could plan for their topics in class to make sure that their students’ learning don’t get affected by the holidays. For employees, they want to know when they’re going to receive holiday pay or bonuses. Most employees are excited to go to work on holidays because they get double pay or additional incentives. Some even do overtime work to maximize their earnings for that day. How much do you get if you go to work on a REGULAR HOLIDAY in the Philippines 2019? How much do you get if you go to work on a SPECIAL HOLIDAY in the Philippines 2019? If employee don’t report for work during this day, he receive no pay, unless the company provides a special incentive based on their current policies. If employee reports to work, he will be paid additional 30% of the daily rate of 100% for the first 8 hours of his work. In excess of 8 hours, he will receive additional 30% of hourly rate on that day. If employee reports to work on a special holiday (even if it technically falls on his rest day), he will get additional 50% of the daily rate of 100% for the first 8 hours of his work. In excess of 8 hours, he’ll receive additional 30% of hourly rate on that day. How much do you get if you go to work on a SPECIAL WORKING HOLIDAY in the Philippines 2019? No holiday pay is given to an employee during a special working holiday since it is considered work on ordinary working days. He is entitled only to his basic rate only. Out of the 19 regular holidays and special non-working days, 13 holidays fall near weekends, thus are considered long weekends. In 2018, there was a total of 18 holidays in the Philippines, including the regular holidays and special holidays. Two special non-working days have been added to the list from 2017: All Souls Day on Nov. 2, 2018 and Christmas Eve on Dec. 24, 2018. This only means that there will be additional long weekends in 2018 for those who will not need to report to work during holidays and special non-working days. And of course, more holidays mean more pay. If you work on holidays, you are paid more than your overtime rate on regular days. If you work on regular holidays, you are paid at least 200% of the sum of your daily rate and cost of living allowance. And if you work on special non-working days, you are paid at least 130% of the sum of your daily rate and cost of living allowance. We also look forward to knowing the dates of the Islamic Holidays because they add up to our list of holidays in the Philippines, but we have to wait until it’s issued in accordance with the Islamic Calendar. Only then will the dates of Eid’l Fitr and Eid’l Adha be issued and announced. Why you need to know the dates of Philippine Holidays? It’s important to know these dates so you can plan for your travels and file for your leave of absence ahead of time. This will also prepare you for the necessary expenses that you will incur during those travels or vacations. Knowing the dates of holidays will help you prepare for your upcoming expenses and book your travels earlier especially when there are available promo fares. 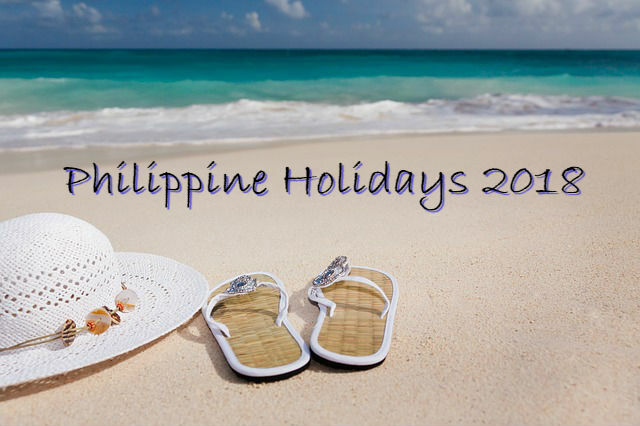 Here’s the list of Philippines holidays 2019 by the Official Gazette.